A solid knife is essential for every hunter, but any blade is worthless if you don’t have an equally effective sharpener. All blades dull over time and a good knife sharpener not only gives you the best function of your tool but also extends the lifespan of your knife and saves money long term. In this review, we will review the best knife sharpeners for hunting and give you pointers on how to choose the right one for your hunting adventures. Are All Hunting Knife Sharpeners the Same? Each knife sharpener offers a perfect solution to a different situation. The main distinction can be made between hand sharpeners and mechanic sharpeners. The first is a more classic approach which can give hunters maximum control and can be used in a multitude of locations including out in the field. A mechanized blade sharpener decreases the room for human error and can be less daunting to use for those new to sharpening. Each type of product uses a different method of sharpening and is also made from a different material. 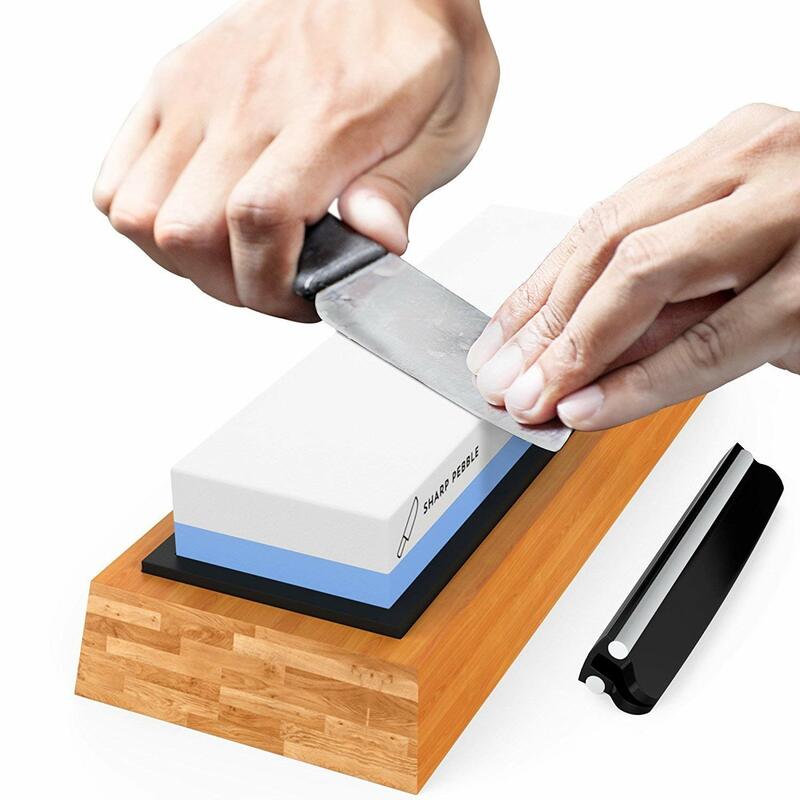 Whetstone sharpening offers a traditional method using aluminum oxide grit, while plates, rods, and strops can be diamond, ceramic, or leather respectively. Some use carbide instead of steel for example, which provides a much quicker finish by literally shaving the edges. Mechanized sharpeners tend to use grit belts for sharpening. What Makes a Great Sharpener? The usefulness of a sharpener is determined by its compatibility with your needs. Here are a few things to consider before investing in a hunting blade sharpener. If you are new to blade sharpening, known for being clumsy, or simply unsteady with your hands, making sure your device is secured to a surface is important. Different products come with different safety features including rubber bases, special handles, or suction cups to fasten them to a surface. For many experienced individuals, these features are unnecessary or extravagant and will get in the way of your task. Some value efficiency while others value patience. Classic sharpeners tend to rely on care and time spent in sharpening, while many newer models save time in a variety of ways. While shaving parts of the blade off may produce a speedy and razor-sharp result, some knife aficionados may be offended by this shortcut and prefer whetstone. Are you looking to use your tool in the field, chuck it in a travel bag, tote it around in the bed of a truck, or leave it on a workbench? The size and weight of your sharpener determine where it can be used. As many know, ounces add up quickly in a day bag or backpack, so picking a lightweight tool for travel is essential. Durability has the potential to be compromised here though, so for some, it might be more beneficial to go with a heavier model and leave it stationary. 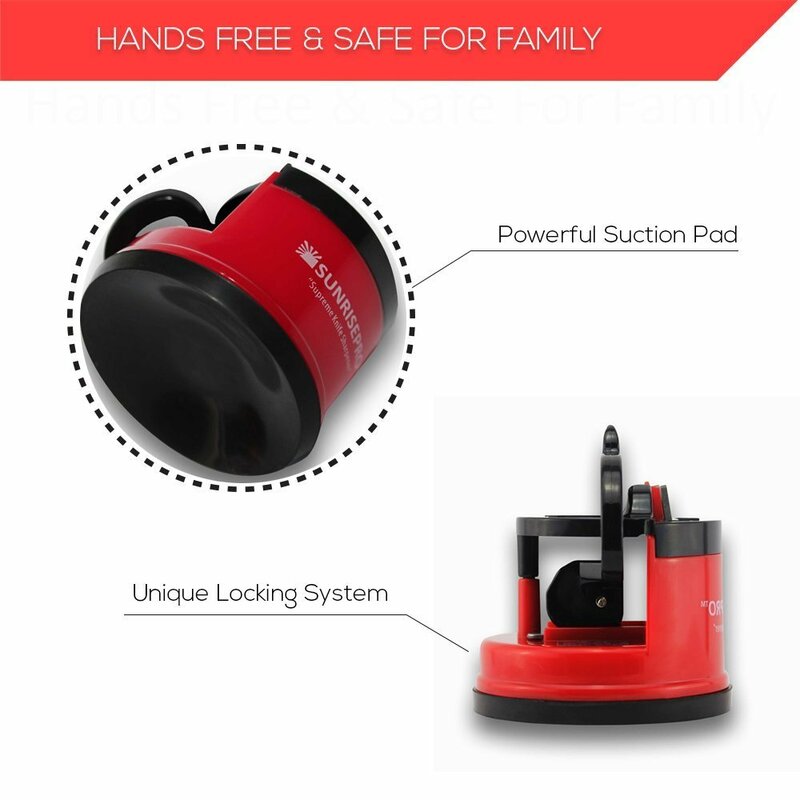 SunrisePro Supreme Knife Sharpener has unique locking system and suction pad for your family's safety. To save you from sorting through millions of options, here are the five top sharpeners. Their pros and cons are outlined, as well as their general features. Each differing product is of top quality and is a perfect solution for a different situation and use. 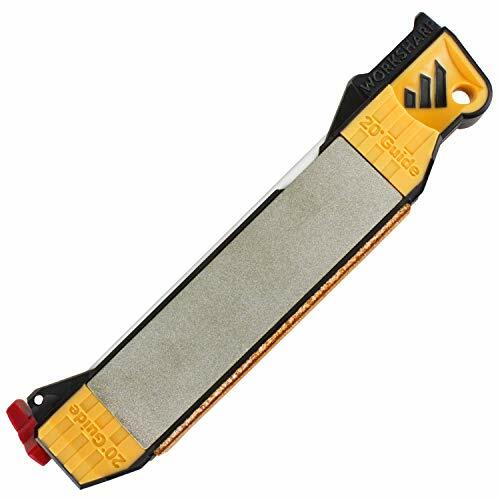 The Sharp Pebble Whetstone Sharpening Stone is the best overall hunting knife sharpener. This aluminum oxide classic hand sharpener features a double-sided (#1000/ #6000 grit ) Whetstone of excellent quality and a bamboo base. The stone itself is durable and guaranteed to last a long time, and is exquisite for any blade, including razors and axes, and can handle any task thrown its way with ease. With a silicon base inside the bamboo bottom, this product ensures a fixed position for safety when in use. The angle guide provides all information to help you sharpen at the correct angle and apply consistent pressure while using. Rated user-friendly and intuitive, this is a perfect tool for someone new to hand sharpening or knife sharpening altogether. It is simple to assemble and has no need for expensive oils as it uses water for sharpening, ensuring no mess during the process, and virtually no cleanup. This premium quality tool is long-lasting and simple to operate and clean. With no-slip safety features and angle guides, it is perfect for beginners and veterans alike, and provides reliable quality performance no matter the task. 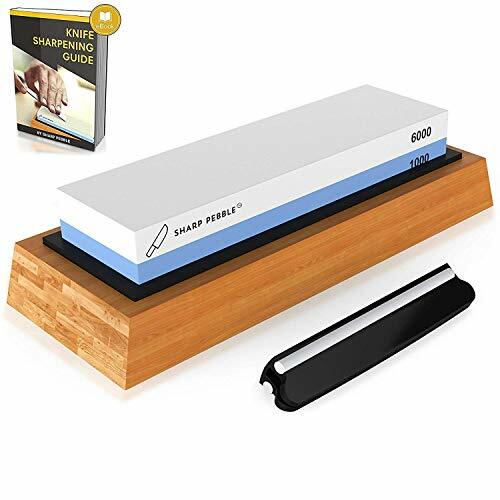 The Sharp Pebble Whetstone Sharpening Stone is an amazing choice for those looking for a classic stone sharpener. It comes with multiple grit levels on the same stone and extra safety features to ensure no slipping while in use. It is easy to clean, and is guaranteed to last a long time. It may take patience to use, but the results are worth it! The runner-up to the best overall hunting knife sharpener is the Work Sharp Field Sharpener. Compact and perfect for use anywhere, even the trails, this tool is only 2.56 ounces, and won't add much weight to any pack. Designed for hunters who need quality performance in the field, home, or shop, this complete set is a perfect solution to travel needs. It features easily removable diamond plates that when moved, expose a broadhead wrench for speedy sharpening in the field. The plates can be attached to expose the abrasive, or flipped during transport so the rough edges don’t damage the inside of your gear bag, and are 220-grit and 600-grit. The 1000 and 2000 grit ceramic honing rod rotates to expose coarse and fine honing surfaces, and a grooved surface for sharpening fish hooks. It also features another smaller ceramic rod for sharpening serrations. This sharpener has specifically engineered blade edge angles with a 20-degree guide for sharpening using the diamond plates, and a 25-degree angle guide for honing a strong micro-bevel. Compatible with a five-step process, this piece offers a complete solution, and features coarse and fine diamond sharpening plates, coarse and fine ceramic hones, and a leather strop. Not only is it compact, but this tool is easy to set up and use, requiring no extra tools or assembly. It is also durable and perfect for use in any element. The Work Sharp Field Sharpener is a powerful yet compact hunting knife sharpener perfect for travel or transport. It is small and lightweight, but makes no compromises in regard to performance or durability. 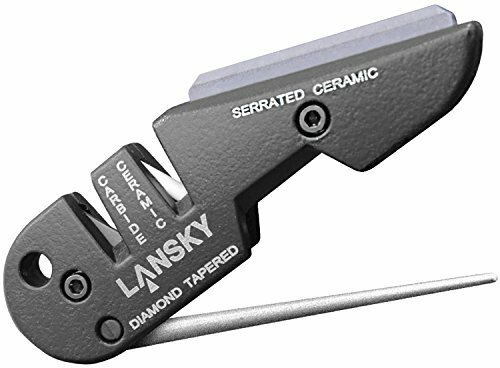 Rated best for the money, the Lansky PS-MED01 Blade Medic is a great choice for those looking for quality results on a low budget. This compact device is perfect for travel in a tool kit but perhaps not on the trails, as it weighs the same as an average pocket knife. It is not only easy to use and transport, but is incredibly efficient. With a diamond rod for fast reconditioning and maintenance and a Tungsten Carbide, your blade can be restored in as little as three or four strokes. A total time saver, this piece also features a serrated knife sharpener designed to get inside the smallest serrations and won’t miss a beat. Rated easy to use, durable, and high quality, this tool will surely be a favorite. It not only produces amazing results, but won’t break the bank doing so, and therefore is perfect for anyone new to knife sharpening, or on a tight budget. This handheld sharpener is of amazing quality for its low price. The perfect size for a tool kit or travel bag, it can go most places easily. It is known for its efficiency, restoring blades in 3-4 strokes, and is a perfect choice for anyone looking for impeccable speed. This knife sharpener is the editor’s pick. It is versatile, easy to use, fast acting, dependable, and compact. It can be used for everything except scissors and fine-toothed knives, and is perfect for hunting blades. This is the perfect tool for a beginner as it is simple to use and is also ideal for anyone who wants an efficient sharpener in an extremely short time. 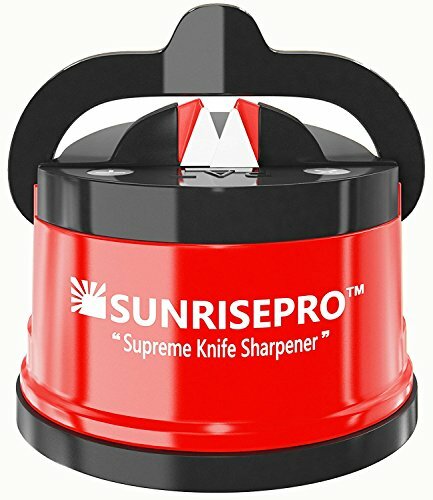 The SunrisePro Supreme Knife Sharpener works ridiculously fast in as little as two seconds, and won’t take any of your time away from other important things. It is easy, quick, and safe to use, as it is fitted with a non-slip rubber base with a patented top side suction pad which provides stability with no risk of movement. It also has an ergonomic safety handle as an added feature to ensure stability when in use, so if slipping is a common problem in your life, have no fear. It is guaranteed to stay still and only takes seconds of your time. This unit is not only effective and efficient but is compact and easy to transport. Perfect for a toolbox, travel bag, or simply home usage, this piece requires no compromises, giving both an excellent sharpen and no unnecessary bulk. The SunrisePro Supreme Knife Sharpener is an amazing choice and an editor favorite. It is compact and fast, sharpening in as little as two seconds. User-friendly and intuitive, this piece also features safety technology like a rubber base and suction cup for stability and peace of mind. For those looking to reduce human error, this corded electric blade sharpener is a good alternative to traditional hand work. The Work Sharp Knife & Tool Sharpener (Ken Onion Edition) is the best electric option. It works flawlessly with a P120 Extra-Coarse Belt, X65 Coarse Abrasive Belt, X22 Medium Abrasive Belt, X4 Fine Abrasive Belt, 6000 Extra-Fine Abrasive Belt perfect for serrations and gut hooks, and can tackle any project thrown its way. This tool is adjustable, with edge bevel options from 15 to 30 degrees, a motor-120Vac/1.5 amp, and a cycle that lasts for an hour of continuous use. The speed motor is also variable for increased control and precision, and features cooling technology perfect for grinding or honing at any speed. The belts are abrasive but flexible, to ensure quality razor-sharp results. This device is dependable and easy to use, with no setup or calibration time needed. For new users, or anyone unready to tackle hand sharpening, this machine does the work for you. Certified frustration-free, this product is simple and effective, letting you get back to hunting with a better knife in no time. 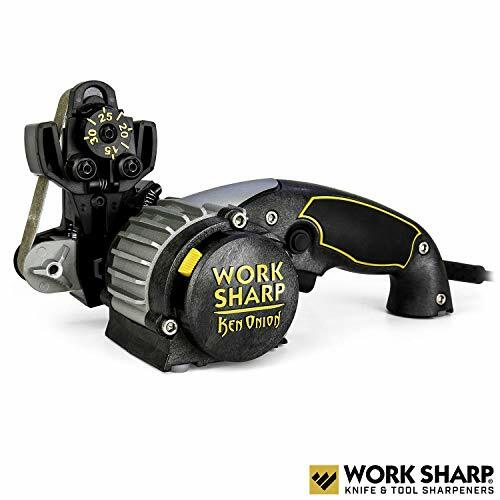 The Work Sharp Knife & Tool Sharpener is the best electric model on the market. It features adjustable motor speeds and different belts and can handle any task. Fast and user-friendly, this sharpener reduces human error and is perfect for anyone looking to avoid tedious hand sharpening. A good knife sharpener can extend the life of any blade and make gutting and cleaning, as well as other duties, easier and quicker. Sharpening your knives before they get too dull ultimately saves time and money and makes hunting easier and more fun! With many different models, it can be hard to choose which is right for you, but there is a perfect fit for every hunter and situation. The commitment of investing in a quality sharpener can be daunting, as there are a multitude of variables and differences between tools. Here are some frequently asked questions and their answers to help you make the most informed choice. What Angle Should I Sharpen My Knife? For a hunting knife, the best general answer is 25 degrees, but it depends on the blade. As an overall rule, the more rugged and durable the knife needs to be, the wider the angle. For example, a 17-degree angle should be used for sharpening to a delicate edge, perfect for razor blades or scalpels. Kitchen cutlery typically uses a 20-degree angle, hunting and outdoor knives use a 25-degree angle, and a 30-degree angle would work for any knife that sees heavy use like cutting cardboard, wire, or carpet. How Long Will a Sharpening Session Take? In short, it depends. The amount of time needed is reliant on the wear and material of the blade as well as which tool should be used to sharpen. In general, sharpening rods take about 30 seconds. Pull through sharpeners take 3-5 minutes, stones take 10-15 minutes, manual sharpening kits take 15-20 minutes and electric kits take about 3-5 minutes as well. Are There Varying Grits Available? Yes! Not only does the material matter, but the grit of that material determines the type of sharpening. Typically, the higher the grit count, the finer the use is. This means that for general sharpening, one may start with a smaller grit count material and then move to something with a larger grit for more precision and refinement. What’s the Proper Maintenance of the Hunting Knife? Like any blade, day-to-day maintenance is the best way to extend the life of your hunting knife. Proper sharpening is important for ease of use as well as less wear and tear on the actual tool. This should be combined with a quick wipe down in the field, plus thorough cleaning of the blade and handle with a cleaner made specifically for the substance of your knife. Storage is also important. A fixed blade should live in a sheath, but if you don’t plan on using it for a while, wrapping the clean, dry knife in plain paper and then a plastic bag with desiccant for moisture absorption should keep it in top condition. Can You Over Sharpen a Knife? Over sharpening would result in a flimsy knife that is too weak and thin to use at all, but this is unlikely and would require a lot of work. Mostly with freehand sharpening systems, a blade can be sharpened so much so it is worn down to the point of uselessness, or in some cases can fold over itself. The more common problem is incorrect sharpening which involves using the wrong angle or switching angles during the process.